In case your boat develops cracks from overloading or gouges from exposure to sharp objects, you can very easily repair these by using fibreglass filler, which is essentially powdered fibreglass that is available on the market for the purpose of repairs. It is important that you sand off excess portions of the filler and protect the area from further exposure with insulation or a fresh coat of paint. 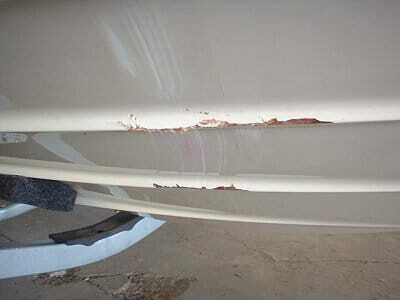 Impact damage can happen when foreign objects hit the hull of your boat. If the damage is minimal, you can use filler and your own DIY repairing skills to alleviate the problem. However, if the damage is pronounced and exposes the core of your boat, it is best to enlist the services of a professional repairman. Cosmetic repairs can be carried out using tools like sanding devices, fresh paint, buffer or polishing compounds and insulation products. Make sure you have all the right tools with you to carry out repairs rather than cause further damage. In many cases, repairs need to be carried out immediately and you will be in a good position to do that if you already have in your possession the required tools, products and supplies.